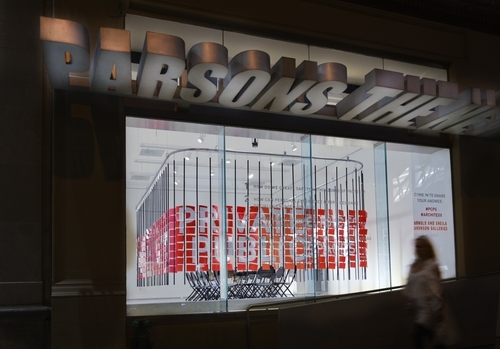 Designed for a storefront at Parsons/The New School, the exhibition framed a design action space where round table discussions and design charrettes were held. The issue was contested spaces, specifically, the last abortion clinic in Mississippi. A call for design proposals of a fence dividing clinic patients and protestors was sent out. The proposals, the size of post cards, were incorporated into the ‘pixelated’ curtain that became the exhibition and enclosure for the space that housed the design action. Design and production team included: Ashley Simone, Michaele Gorman, Kimberly Tate, Irina Schneid, Lisa Maione. Design is most powerful when it engages the social and political dimensions of the built environment. In the case of access to reproductive health care facilities, such as abortion clinics or similarly controversial spaces, design has the potential to impact personal experiences at vulnerable moments. ArchiteXX is calling upon designers and interested citizens to think more deeply about the role design can play in the ongoing, voracious dialogue that is taking place at the public-private thresholds of abortion clinics across the US. These thresholds take the form of fences, doorways, and sidewalks that mediate spaces, which are simultaneously occupied by individuals–protesters, doctors, patients– who possess strong personal sentiments and motivations that are often in opposition. Such is the case of the fence surrounding the Jackson Women’s Health Organization, the only abortion clinic in Mississippi and the site that is the subject of this call for design action.